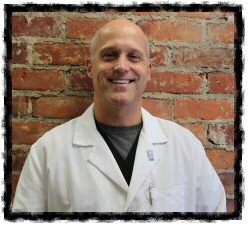 I am a general dentist with a practice in Cincinnati, Ohio. I am a native Cincinnatian that attended Vanderbilt University ’79 for undergraduate studies and then on to Ohio State University ’83 for dental school. I have been a member of the Cincinnati Dental Society, Ohio Dental Association, and the American Dental Association since 1983 as well as an alumni of the Pankey Institute. After graduation I returned to Cincinnati and followed in the family tradition. Both my father and my brother are dentists. My father is retired and I have practiced with my twin brother in Hyde Park since 1983. Our practice actually has its roots in this area since the early 1920s with Dr Carlos Schott who then passed it on to Dr Charlton Gaskill and then on to us. I actually have a few current patients whose records begin with Dr Schott! I feel a privilege to be part of such a long standing tradition here in Cincinnati. Dentistry has changed dramatically over the years with computers, digital x-rays and imaging, lasers, sedation, Invisalign, implants and the incredible developments in aesthetic dentistry. But the constants over the years are the patient’s need for personal attention and their desire to be well informed. I look forward to keeping you updated on the newest developments in dentistry and topics that hopefully will be both of interest to many of you and helpful in improving you and your family’s oral health. I would like to acknowledge Dr. James Springer for his dedication to .MD and his blog as the national dental expert for the past three years. Jim and I were classmates at Ohio State and I can personally attest to his passion about the field of dentistry. I know everyone appreciated his perspective that he communicated on a weekly basis. Thanks Jim, you are a hard act to follow.